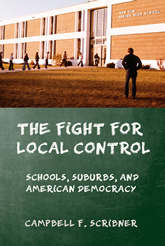 Scribner’s account unfolds on the metropolitan fringe, where rapid suburbanization overlapped with the consolidation of thousands of small rural schools. Rural residents initially clashed with their new neighbors, but by the 1960s the groups had rallied to resist government oversight. What began as residual opposition to school consolidation would transform into campaigns against race-based busing, unionized teachers, tax equalization, and secular curriculum. In case after case, suburban conservatives carved out new rights for local autonomy, stifling equal educational opportunity. Yet Scribner also provides insight into why many conservatives have since abandoned localism for policies that stress school choice and federal accountability. In the 1970s, as new battles arose over unions, textbooks, and taxes, districts on the rural-suburban fringe became the first to assert individual choice in the form of school vouchers, religious exemptions, and a marketplace model of education. At the same time, they began to embrace tax limitation and standardized testing, policies that checked educational bureaucracy but bypassed local school boards. The effect, Scribner concludes, has been to reinforce inequalities between districts while weakening participatory government within them, keeping the worst aspects of local control in place while forfeiting its virtues.